The most important photo ever taken? It may not look very exciting, but the photograph above has an important place in history. 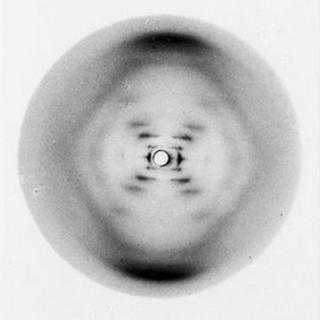 Known as Photo 51, it's an X-ray diffraction image of DNA and has at least a claim to be the most important image ever taken. It's one of about a million artefacts being put online by the Wellcome Trust as part of an ambitious project to tell the story of genetics, from Mendel to the Human Genome Project. The material includes research documents, notebooks, letters and images which are currently housed in six institutions in Britain and the United States. These are the Wellcome Library, King's College London, the Churchill Archive Centre Cambridge, University of Glasgow, University College London and Cold Spring Harbor Laboratory. So why is Photo 51 an iconic image? King's College archivist Geoff Browell says: "Photo 51 was taken by Rosalind Franklin and Ray Gosling in the Biophysics Department here in 1952. It is arguably the most important photo ever taken. "It was this image that gave the final clue that enable Maurice Wilkins, James Watson and Francis Crick to put together research from the previous two decades and understand that DNA was a double helix." Photo 51 is not the sort of image you would take with a normal camera. A tiny sample of hydrated DNA was mounted inside and then an X-ray beam shone at it for more than 60 hours. The beam of X-rays scatter and produce an image from which a 3D structure can be determined. The resulting striped cross shape you can see may not mean much to the casual observer, but to a small group of scientists it proved to be a revelation. It was shown by Maurice Wilkins of King's College to James Watson at the Cavendish Laboratory in Cambridge, who said "my mouth fell open and my pulse began to race". I'd be delighted to know what your suggestions are for the most important photo ever taken. The image of Photo 51 is tiny - just a few centimetres across - and holding the glass plate in my hands felt like handling a piece of history. The story of the discovery of the structure of DNA is fascinating. It was Crick and Watson from Cambridge who published the key paper in 1953 and they later shared the Nobel prize with Wilkins from Kings. Franklin died of cancer and the prize cannot be awarded posthumously so she never got to share in the glory. As well as all the scientific documents that will go on display there is also plenty of personal material such as the cartoons of Maurice Wilkins. I was lucky enough to interview him in 2003 on the 40th anniversary of the DNA milestone. Considering his crucial role in 20th century biology and genetics he was one of the most unassuming and modest scientists I've met. Wilkins was concerned about social impact of his work. The cartoon below shows a man pulling a DNA shaped corkscrew from a bottle marked "Secrets of Life - Pandora's Brewery". He says: "When we find the good gene we will be Masters of the Universe." Another revealing image is shown below. It's a postcard that Francis Crick had printed and used to be sent in response to the mass of unsolicited requests he received: "Dr Crick thanks you for your letter but regrets that he is unable to accept your kind invitation to: send an autograph, provide a photograph, cure your disease, be interviewed, talk on the radio, appear on TV etc." Crick, or his assistant, would put a tick next to the relevant section. I find it both rude and hilarious. I have a sneaking admiration for such a masterly putdown. Have you ever received a better one? The Wellcome Library's history of genetics should be available online from October and will give free access to all. I did a report for the Today programme which includes contributuions from Sir John Sulston, former director of the Wellcome Sanger Institute. You can listen to by clicking on the black box on the right. Today also has some images from the archive on its website.